One of the things I would like to work on in 2017 is my photography. I am joining in for my sixth week with Nana Cathy and Wild Daffodil‘s weekly photo challenge. This week’s one word prompt is Seed. Back to the village this week with old, dried, seed heads on the long grass at the edge of the fields in silhouette as the sun tries to burn its way through the morning mist. My latest wreath is a first birthday gift for a very special someone. As always the wreath started with lots and lots of stripes of single crochet, this time all in sky blue colours. Having learnt my lesson from the number of ends generated by the uniformly narrow stripes on my Moorland Wreath I reverted back to random width stripes. This did make the sewing together easier but this being my first 30cm wreath in while I had forgotten just quite how long the strip needed to be to go around alllllllllll that wreath base. I did need the bigger base though as I had big plans for what to dangle inside it! This was who I had in mind! 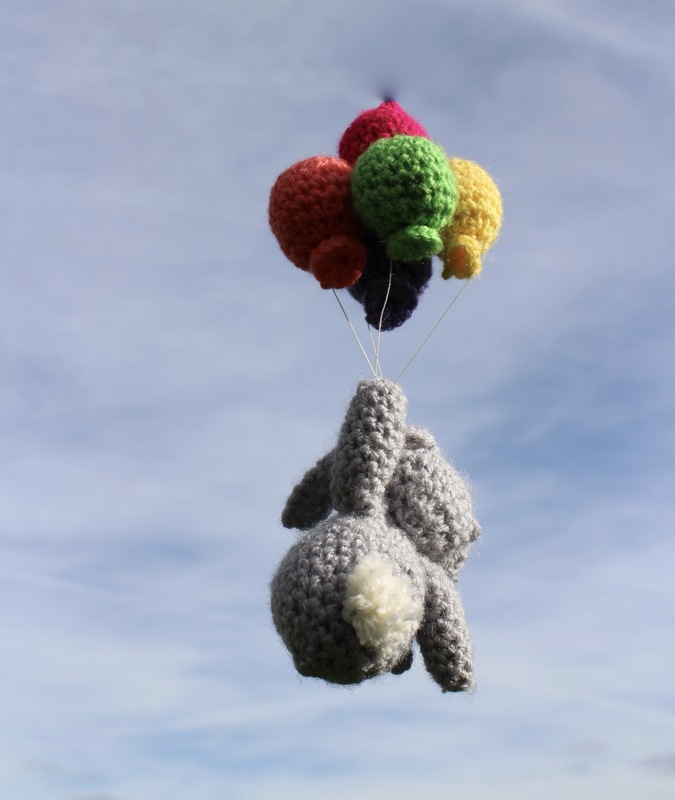 A little floppy eared bunny hanging onto a bunch of brightly coloured balloons. I am going to confess that I entirely made him up as I went along and so it is not possible to share a pattern. Having made 5 of the balloons I do know how I did those so they may well crop up somewhere again but the bunny is likely to remain one of a kind. 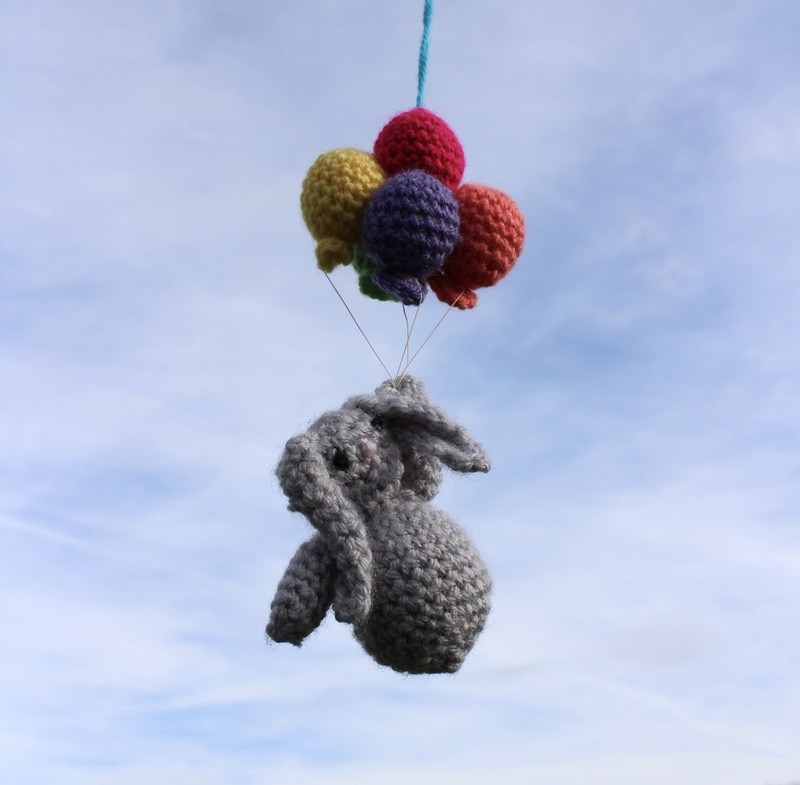 As soon as I finished using waxed linen thread to sew the bunch of balloons to the bunny’s hand one Sunday morning I knew I wanted to try and get a photo of him drifting off into the blue sky. Of course I was forgetting that I live in Yorkshire and it is February! But there was the odd break in the cloud and I think he looks pretty cool. I love to see when people share behind the scenes shots of their photography so here’s mine. 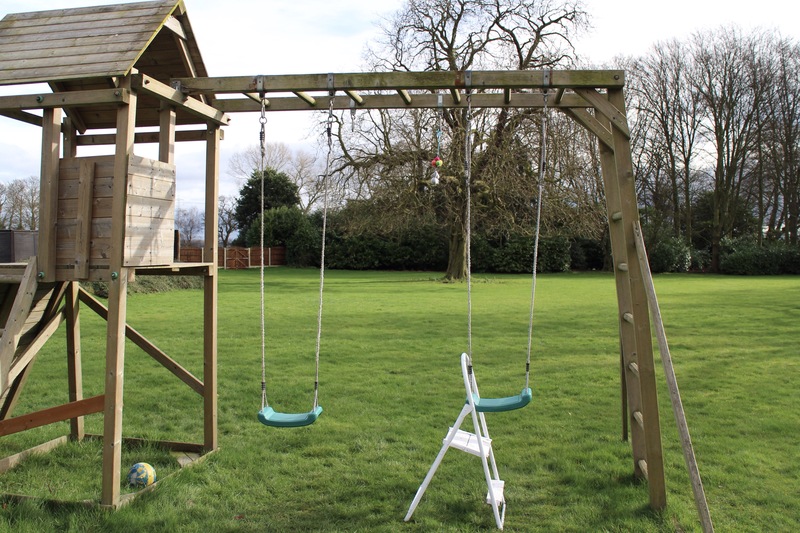 You can just about spot the bun dangling between the swings. You might also notice the step ladder has sunk into the grass because its February and a bit soggy. I thought we might have been done at that point, with the bunny and the blue sky, but after looking at him hanging on the wall for a while I decided he needed clouds as well. So I packed my crochet hook and a ball of white yarn as we set of to my lovely motherinlaw’s for our Sunday dinner and as everyone else tucked into their eve’s pudding and custard I started on a blobby white cloud. By bedtime there were 4 of them stitched to the base and the wreath was ready for a final photograph this morning and to be gifted this afternoon. Talk about last minute! On my kindle The Sun is Also A Star by Nicola Yoon. Off my hook and onto my sewing needle a new wreath cover. I only started this book this morning and am heading in trepidatiously. I did not enjoy Everything Everything at all, mainly due to seeing the “massive twist” coming from the first chapter. 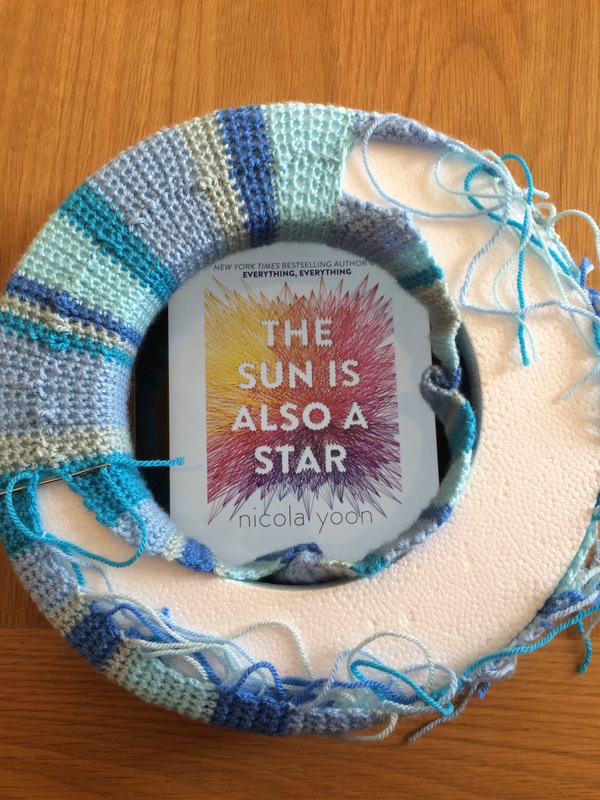 But I did like Nicola Yoon’s writing style, The Sun is Also a Star is highly rated on Goodreads and I like the sound of the story as well as fitting into the Read Harder challenge so I am giving it a try. This wreath cover is destined to be a first birthday present for a very special someone and I am excited to start work on the embellishments. 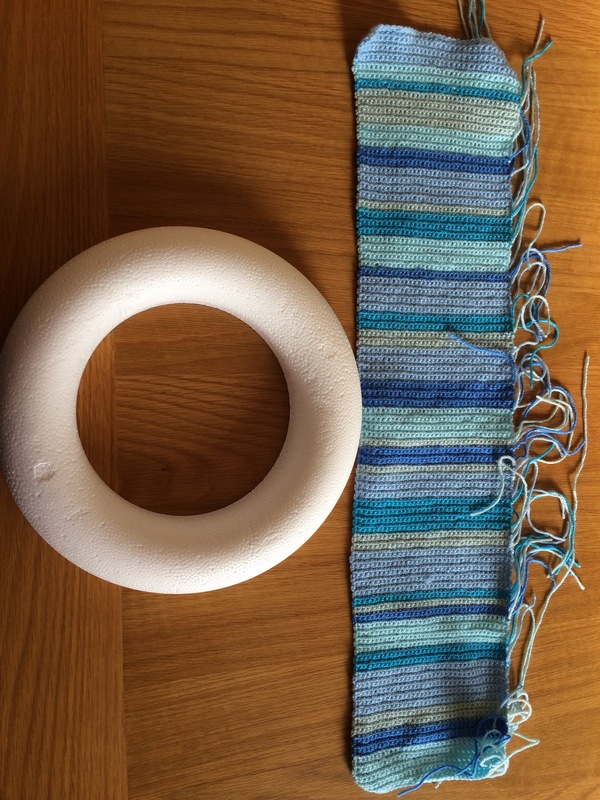 This is the first time I have worked on a 30cm base in a while and I forgot just quite how much longer the strip of stripy single crochet needed to be than the more reasonable amount required for a 23cm wreath. But I now have almost a metre of stripes and the sewing on can begin with the exciting creative bit just around the corner! On my kindle Lady Chatterley’s Lover by D. H. Lawrence. On my hook lots of sheep parts! This week’s Yarn Along is all about struggle. I am struggling with both this pattern and this book. Lady Chatterley’s Lover is my book for challenge number 16 (Read a book that has been banned or frequently challenged in your country) of Book Riot’s Read Harder Challenge and I’m finding it rather slow going and a bit of an uphill battle. However it transpires that the UK is not as big on banning books as many other countries and so there wasn’t a huge range to chose from for this challenge. And so I plod along refusing to be beaten! I am also finding writing this sheep pattern to be tougher than I imagined. When I made my first sheep to go in my Moorland Wreath I sailed along happily making it up as I went along and jotting a few notes down. As I have gone to translate those notes to a pattern I am finding that there are rows missing, inconsistencies and the notes don’t make a sheep like the one I already have. It’s all very frustrating. Stubborn as I am I will be continuing with both endeavours until I am able to tick the book from my challenge list and write up the pattern but I am not having as much fun this week as I like to with my reading and creating. Fingers crossed next week works out better for me! One of the things I would like to work on in 2017 is my photography. I am joining in for my fourth week with Nana Cathy and Wild Daffodil‘s weekly photo challenge. This week’s one word prompt is Fence. I live in the countryside surrounded by farmland and there are a lot of not especially effective fences around! This one, at the edge of a garden in the village, is my favourite falling down fence.